Born 3 August 1785 in Rocky Point, South Kingston, R.I., 20 August 1785, was appointed Midship man 7 April 1799 and served in revenue cutter General Green during the Naval War with France. he fought in frigates Adams and Constellation during the Barbary Wars. 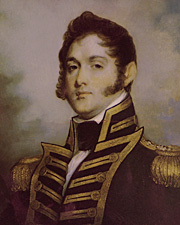 In the War of 1812, Perry constructed and commanded a fleet of American warships on Lake Erie. When his flagship Lawrence was shattered and sinking in the Battle of Lake Erie, Perry fired her last effective gun, took his battle flag, and rowed across shot-splashed waters to Niagara where he fought on to victory, and reported, "We have met the enemy and they are ours" The victory gave the United States control of Lake Erie and enabled Perry and General Harrison to take a large part of Canadian territory which helped American Commissioners at Ghent to negotiate a treaty favorable to the United States. hence peace was restored, Perry commanded frigate Java in the Mediterranean. in May 1819 he went to Venezuela to seek help in protecting American ships off the northern coast of South America, waters then plagued by pirates. After sailing to the Spanish Main in John Adams, he ascended the Orinoco River in Nonsuch. At Angostura, Perry succeeded in negotiating a favorable treaty, but contracted fever and died 23 August 1819. In 1799, at age 14, Oliver Hazard Perry entered the Navy as a midshipman. Following distinguished service in the Quasi-War with France and the Barbary Wars, at age 27, he was given command of U.S. Naval forces on Lake Erie in the War of 1812. There he won a decisive victory over the British on September 10, 1813 which gave control of the lakes to the United States. At the young age of 34, Commodore Oliver Hazard Perry died of yellow fever aboard John Adams during a Naval expedition to Venezuela. He is at rest in Newport's Island cemetary. August 23, 1785  August 23, 1819. SwStr: t. 512 l. 143' b. 33' dr. 10' s. 7 k. cpl. 125 a. 2 x 9", 2 x 32-pdr. sb , 1 x 12.pdr. how. Commodore Perry , an armed side wheel ferry, was built in 1859 by Stack and Joyce, Williamsburg, N.Y.; purchased by the Navy 2 October 1861; and commissioned later in the month, Acting Master F. J. Thomas in command. Commodore Perry sailed from Hampton Roads, Va., 17 January 1862 to join the North Atlantic Blockading Squadron, and on 7 and 8 February took part in the attack, in cooperation with the Army, which resulted in the surrender of Roanoke Island, part of the long campaign through which the Navy secured key coastal points. Commodore Perry took part in the capture of Elizabeth City on 10 February, and the next day captured the schooner Lynnhaven. As operations along the North Carolina coast continued, she joined in the capture of New Bern and Washington in March, and in April took singly or in concert with others of her squadron four schooners and a sloop in the Pasquotank River and Newtogen Creek. On 3 October 1862, Commodore Perry joined in an Army-Navy expedition against Franklin, Va., and on 10 December, joined an attack against Plymouth, N.C. After another combined expedition against Hertford, N.C., on 30 January 1863, Commodore Perry patrolled constantly in Pamlico and Albemarle Sounds and the streams which enter them, frequently exchanging fire with small detachments of Confederates ashore. Repaired at Norfolk and Baltimore late in 1863, she returned to her squadron in March 1864 for duty in the inland and coastal waters of Virginia on picket, guard, and patrol duty, joining in many amphibious expeditions, until the close of the war. She sailed from Norfolk for New York 12 June 1865, and there was decommissioned 26 June and sold 12 July 1865.